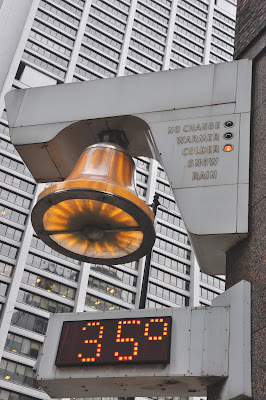 I've seen this bell and the clock/temperature display a thousand times (maybe more). But, until today, I never noticed that there was the little weather change display on it as well. In this case, the temperature was getting colder. I can't wait until the "Warmer" light starts coming on. In the summer time this is a fountain. 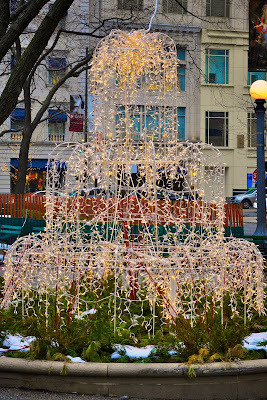 They keep the illusion up during the winter months with a cascade of lights. 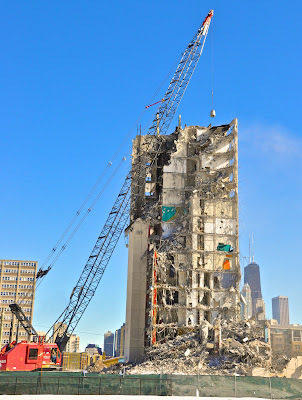 One of the last high rises from the Cabrini-Green Housing Project is under deconstruction. 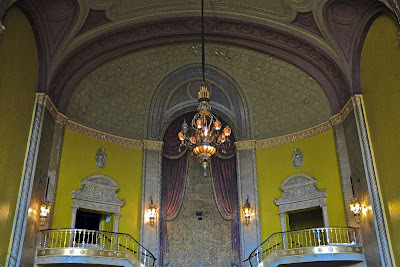 This is the ceiling of the lobby of the Congress Theater in Logan Square. At one time it was a movie theater. More recently it is a concert venue -- except on Sundays. On Sundays it hosts the Logan Square Farmers Market -- one of the growing number of year-round farmers markets in Chicago. A new local brewery/restaurant opened up over in Logan Square recently called Revolution Brewing Company. It has fun and flavorful food (Bacon Popcorn, Cheddar Ale Soup, Sweet Potato Cakes, to name a few of the lighter menu items) and a nice selection of house craft beers and "guest taps". The decor is interesting as well. 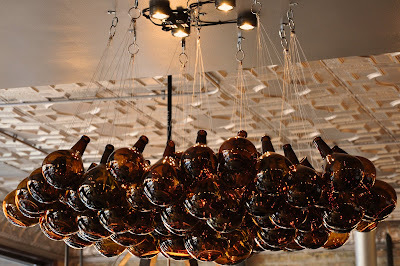 The bulbs in the chandelier, shown here, are beer bottles with glass blown rounded bottoms. Yesterday's sunrise over Lake Michigan. Interesting clouds and lovely colors. One of the many things I like about Millennium Park is that it is landscaped to look very pretty in all the seasons. This side garden, dusted in snow, is a little peace and quiet amid the urban roar. This is Cloudgate, also know as the Bean. It looks lonely. I'm not sure I've ever seen it during the day without people surrounding it. Then again, it is snowing rather heavily and has been all day. I'm not sure you can tell but there is a layer of snow accumulating on the top of the curve. Another scene from the North River Chicago Industrial Corridor in Lincoln Park. This one is from the General Iron Industries Recycling Center. I can't help but think of that Claw Vending Machine Game when I see these cranes grabbing piles of stuff. Traffic was all piled up today. It was a real mess. 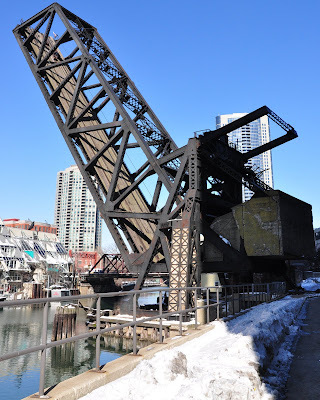 You don't typically think of Lincoln Park as being an industrial area but it is home to the North River Chicago Industrial Corridor, which contains a steel manufacturer, and various scrap metal salvaging and recycling centers. Since today is National Wear Red Day, I thought I'd post some photos of some Vermillion Flycatchers. These were taken at a bird/nature area in San Juan Del Cabo, Baja California Sur, Mexico. Organized by the American Heart Association, the purpose of Wear Red Day is to raise awareness of women's heart disease. Todos Santos is a small town about an hour north of Cabo San Lucas, via a scenic drive with many "Curvas Peligrosas" (Dangerous Curves). It is an arts oriented town and this beautiful archway leads into one of the galleries. Interesting rock formation along the beach in Cabo San Lucas, Mexico. To me, it looks a little like a roaring dinosaur. Another view from Cabo San Lucas, Baja California Sur, Mexico. This one is a photo of the early evening sky and the Pacific Ocean. Clouds are rare. And even when they do appear they don't stick around for very long. Although this LOOKS like the January Full Moon (known as the Wolf Moon) rising over Lake Michigan, it is actually the Wolf Moon rising over the Pacific. I got the opportunity to go to Cabo San Lucas, Baja California Sur, Mexico last week. This was taken on the last night during a whale watching cruise. The whales seem to wave good-bye.